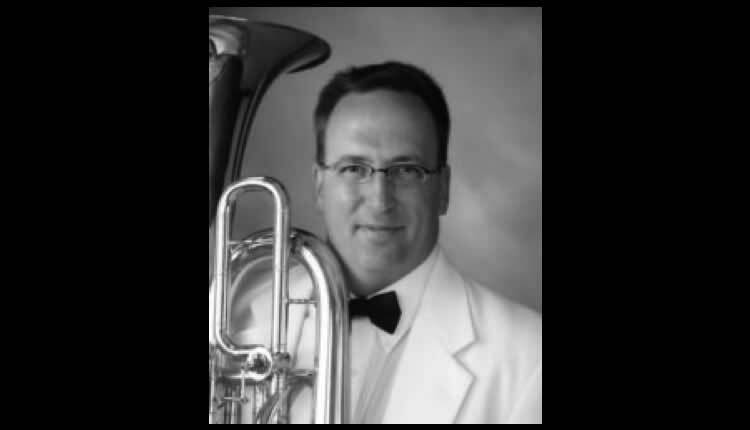 David Zerkel is Associate Professor of Tuba and Euphonium at the University of Georgia, leading an active career as both a performer and educator. Previously, he taught in a similar position at Illinois State University. His students have distinguished themselves by winning international and national competitions and attaining positions with professional performing organizations. David has performed with many orchestras, to include the Philadelphia, Chicago Symphony, Atlanta Symphony, National Symphony, Baltimore Symphony and the Kennedy Center Opera House Orchestras. He is a member of the Brass Band of Battle Creek, was a founding member of the Washington Symphonic Brass and has performed with the Burning River Brass. He began his performing career as a member of the United States Army Field Band and The United States Army Band, located in Washington, D.C.
David has performed as a featured soloist at workshops and symposia, including the Leonard Falcone Festival, several International Tuba Euphonium Conferences, and the United States Army Band Tuba Conference. In addition, he has performed as a solo recitalist at many of the leading colleges and conservatories in the United States. His first solo CD, American Music for Tuba: Something Old, Something New, was selected as the recipient of the inaugural ITEA Roger Bobo Award for Excellence in Recording at the 2006 ITEC. His newest CD, Tuba Helper, was a Bobo finalist at the 2008 ITEC. Why did you choose to play the tuba and how did you get started? David Zerkel: To be honest, I chose the trumpet! (Chalk it up to youthful indiscretion!) It had to be trumpet because my big brother played the trumpet and, naturally, I wanted to be just like him. I was a pretty “middle of the pack” trumpet player when, at the age of 12, it was determined that I would need to see the orthodontist. Our band program had very few tuba players, so my middle school director asked me to switch to the tuba. Fortunately, it was a happy fit! What motivated you at a young age to practice? David Zerkel: I, like most kids, was motivated to practice by auditions. I wish that I would have had someone to extol the virtues of practicing at a young age, but I didn’t. So, I did most of my serious practicing for things such as All-County and All-State Bands. When I ordered the books for the etude material for these auditions, I became very curious about all of the other etudes in the books, read them, and found this to be where my first obvious growth on the instrument took place. I was also very curious about learning the trombone and euphonium (our band program had some unused instruments), so I spent a good bit of time at home trying to figure these out. What kind of advice were you given when you first started? What advice would you give to a young tuba or euphonium player just starting out now? David Zerkel: The only real pragmatic advice I received regarding the tuba was to get rid of some of the trumpet embouchure habits, such as smiley corners. The most important advice that I would give young players is to get some good etude books and/or solos as soon as possible. If tuba players rely on the parts they see in their band folders to help them develop technically, it will be a slow and arduous journey. A good place to start for a middle school tuba student might be the Getchell First and Second Book of Practical Studies (pub. Belwin Mills) or the Arban Complete Method for Tuba (pub. Encore Music). For euphonium I’d recommend the Bordner First and Second Practical Studies for Trombone (pub. Alfred) and Arban Complete Method for Trombone or Baritone. It is really important for low brass players to develop melodic skills in order to advance as complete musicians. What would you say are the three or four most important things a young tuba or euphonium player should focus on during the first few years of playing? David Zerkel: I’d say that the most important thing as a young player is to not be overwhelmed by the size of the instrument! Many young players see this big thing in their laps and think that they have to blow HARD to make it work. In all actuality, the exact opposite is true – the air needs to be slow and thick as opposed to fast and thin. So, item number one is to slow everything down and to create a full, sustained sound that will make an outstanding foundation for their band. (Pat Sheridan and Sam Pilafian’s Breathing Gym book and DVD would be both wildly entertaining and extremely beneficial for helping a young brass section to develop good air habits) Item two is to work on developing a great sense of rhythm. Let’s face it, the low brass player essentially has two very important jobs in the band: foundation and pulse. Therefore, it is critical that the young player takes pride in fulfilling these roles and that the director makes sure that they recognize the low brass for doing a thankless job well! In football, if it weren’t for the offensive line, the star running back wouldn’t get too far-the same is true in music: the band is only as good as its foundation. Finally, I would encourage a young player to gain as much control as possible of the two octaves between low F and high F. This is what tuba legend Harvey Phillips always referred to as “the cash register”; the range in which the low brass player will do 90% of their playing. What personal qualities do you need to be a musician? David Zerkel: The same qualities that one would need to be a success in any facet of life: Dedication, perseverance, imagination, resourcefulness, integrity, curiosity and (last but not least!) patience. What are three things you like best about being a tuba/euphonium player? David Zerkel: First, I love the sounds of these instruments! I think that both are capable of such an interesting array of colors and, when played well, sound every bit as beautiful as any other instrument. Second, I love the fact that tuba and euphonium players are, for the most part, a great group of happy and gregarious people! There are very few enormous egos among us and when you get a group of tuba and euphonium players together, a good time is pretty likely to be had. Finally, I like the fact that the pace of growth in the comparatively short history of our instruments is blisteringly fast. The developments that have taken place in terms of instrument development, literature, and performance have been astounding, and there is no slowdown in sight for the foreseeable future! Who were your major influences as a young tuba player? Who were your teachers? What was the first tuba recording you listened to? What was your favorite recording? David Zerkel: My first influence was whoever the guy was playing the tuba in our church orchestra! I don’t know who it was, but I have vivid memories of hearing this guy playing these florid arpeggios from my Sunday school classroom (which was five rooms away!). The first tuba record that I owned was a gift from a music teacher in high school, and it was John Fletcher’s recording of the Vaughan Williams Tuba Concerto. That remains my favorite recording of that piece and I think that John Fletcher’s approach to the tuba informed the way that I developed. I had my first tuba lesson when I was a freshman in college, with David Bragunier, the tubist with the National Symphony Orchestra. He was a very musical guy and really taught me a lot about the aesthetics of music. David Fedderly of the Baltimore Symphony really helped me immensely with my physical approach to the instrument. Finally, Ed Livingston, my teacher at Illinois State, taught me all the life lessons that I needed to know to be a successful working musician. I think of all three of these guys almost every day, as they all helped me in ways that I couldn’t begin to articulate! You’ve had an interesting career path as a tuba player. What was it like playing in the United States Army Field Band? How did that playing experience prepare you for other things down the road? David Zerkel: I am very grateful for the opportunities that I had to be a member of both the United States Army Field Band and The United States Army Band (Pershing’s Own). The jobs were as different as night and day. In the Field Band, it was all Concert Band work and we were on tour about 120 days a year. It was a great time with great people, but when babies started to emerge on the scene, all of that time on the road wasn’t congruent with the kind of dad that I wanted to be. So, I was fortunate that there was an opening with Pershing’s Own at the time of the end of my first enlistment in the Field Band. I took the audition, won the job, and essentially traded my bus seat for a sousaphone. I was a member of the ceremonial unit at TUSAB, so I was essentially a professional sousaphone player for eight years. (Insert joke here!) While the Field Band job was more satisfying form a musical standpoint, the fact that the new job kept me at home allowed me to have some great freelance opportunities and to begin to build my resume as a performer. Both were meaningful and valuable experiences that I wouldn’t trade for the world. You also play with the Brass Band of Battle Creek and have subbed with professional orchestras such as Philadelphia, Chicago Symphony, Atlanta Symphony, National Symphony, Baltimore Symphony and the Kennedy Center Opera House Orchestras. How do you get the opportunity to play with this type of ensemble and what type of practice do you do in order to prepare for this type of playing? David Zerkel: I guess that as a young professional in the Army Band, I became accustomed to saying “yes” when the calls for work came in! Once I say yes, I feel that I have the obligation to show up musically prepared and be professional and courteous. If you play your part well and behave in a way that leads to people wanting to see you on the stand again, your phone will continue to ring. It is important to remember that none of these gigs are about ME, they are about the group for which I was hired to play-the minute you lose sight of serving the music instead of serving your ego, you are in trouble. I feel fortunate that I am able to play with some really wonderful musicians, so I cultivate these relationships with great care. As for preparation, there are no special ways that I practice to play with these groups. I think that sometimes tuba players can get in the habit of approaching orchestral playing as some sort of athletic event, rather than a musical event. The basic premises of good musicianship still apply: great sound, great time, great phrases. If you practice these things at a bigger dynamic, you should be in fine shape. I always ask my students to remember this: If someone tells you that you play with a really big sound, it is a compliment, 100 percent of the time. If someone tells you that you play really loud, it is NOT a compliment 100 percent of the time! Always make a sound that you are proud to call YOUR voice! I understand that you have several solo recordings available and have also done some recent recordings that are more of an educational resource for students. Will you tell us more about those projects? David Zerkel: I have recorded two solo CDs. The first is “American Music for Tuba: Something Old, Something New.” It is a collection of original works for tuba and includes some early works for tuba and some newer pieces that are on the verge of becoming the “new standard literature” for tuba. The second CD points me more in the direction that I’m likely to continue in my professional life, which is to develop materials that will be particularly helpful to the next generation of tubists. It is entitled “Tuba Helper: Solos for the Developing Tubist.” It is a collection of works that have become fairly standard pieces for solo and ensemble contests and college entrance auditions. I recorded all of the pieces on this CD on the Contrabass Tuba because the type of player that is likely to be playing these works will probably have a BBb or CC tuba. (The BBb and CC are considered Contrabass and the smaller and more nimble F and Eb tubas are called Bass Tubas) A vast majority of new literature the tuba has a very high tessitura and most of the tuba recordings that are commercially available feature the bass tuba. A student with a BBb tuba in their lap will have a tough time emulating the sound of an F tuba, so I thought that it was important for students to have a model of effective playing on the big horn. As I mentioned before, I’m really on a mission to provide useful materials for young players. I have begun work on what I’m calling the “Tuba Etude Project” on YouTube. My goal is to record every etude from the standard canon of tuba etudes, which includes Rochut, Blazevich and Kopprasch. When I am done with these books, which is a handful, I will continue on with other books such as Tyrell and Snedecor. I also intend to record the all-state band etudes for each state that students can access. This project not only will be a reference tool that might encourage younger players, but it is also a project that will keep me honest as a player!! David Zerkel: I do have another big project in progress right now which is keeping me very busy. I am working on a book project for Potenza Music Press that is a pedagogical approach to learning the standard orchestral repertoire. I am examining these excerpts in depth; covering aspects such as historical perspective, musical terms, the context of the excerpt within the larger piece, opportunities and challenges that the excerpt presents, and practice room strategies. There will also be a CD that will contain a performance of each excerpt. As soon as the orchestral book is complete, I will begin a similar book that will examine the standard excerpts for wind band. I’ve got my work cut out for me for a while! As President of the International Tuba Euphonium Association, what are your immediate goals and aspirations for this organization? David Zerkel: In these economic times, I think that every arts organization is striving to stay relevant to the needs of their memberships. The manner and method in which people consume information has shifted dramatically over the past ten or so years. My immediate goal for ITEA is to work to increase the quality and quantity of information available on the web, so that our members have a wealth of really interesting content at their fingertips when they visit our website. We already have a great quarterly journal, but contact once every three months is not enough to stay in touch with our members. The members of the board of directors are committed to finding new ways to make ITEA an organization that every student and professional feels compelled to join. ITEA can open the world of tuba and euphonium up in a really cool way for middle and high school students, so I encourage band directors to get their students involved! Of course, I would love to see us continue to build on the strength of our regional and international conferences, which are wonderful events. What advice do you have for music educators who will start young tuba euphonium players? David Zerkel: Be patient! I find that it is much easier for very beginning students to start on 3rd partial F, rather than low Bb, so that might be a good place to start. Other than that, insist on good musical habits from your low brass player – because they are usually playing background roles in the music, it is easy to overlook their progress (or lack thereof). As soon as it is practical, get them playing music that is melodically compelling and try to provide them with challenges that they wouldn’t be likely to see in their band folders. Try to expose them to a variety of different music and recordings, as this will really light a fire under a curious kid! Finally, remember that it takes a fairly significant amount of air to play these instruments, so it is important that young players learn to pace their air. Eight count long tones at mezzo-forte or forte will go a long way toward building a strong foundation for your ensemble. What advice do you have for younger tuba and euphonium players? David Zerkel: I would challenge younger players to think big! Don’t let your perceptions (or other people’s perceptions) of what the tuba and euphonium can and cannot do limit your advancement. Don’t just strive to be an outstanding tuba or euphonium player, but strive to be an excellent musician who just happens to play the tuba or euphonium! Be curious and don’t be afraid to try new things, even if it means “failing”. As far as playing advice goes, use lots of fat slow air and strive to make the very best sound that you can make every time you pick up the instrument! Read as much music as possible – if you can become fluent in both bass and treble clef, you will never run out of interesting music to play! Be creative and try to find musical friends that would like to play with you, as we are not limited to the “traditional” groups like band, orchestra and brass quintet. If a bass guitar can play cool grooves, you can too! But most of all, enjoy what you are doing and take pride in your progress and accomplishments!